My investigation consisted of me being nosy and trying to find out where to pick up a couple of packs of O Pee Chee because they look so cool, and I like retro cards. It seems as though the retro cards are my favorites to open, and these were no disappointment. I couldn't care less about the design change because they are nice the way they are. It was nice to get cards that don't look like everything else that has been out or tried in the past few years. These have a great look to them, they are not glossy which I think adds to them. 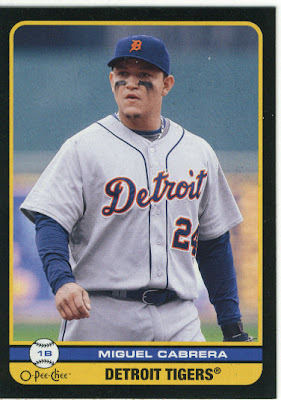 The OPC inserts from UD were glossy and ehhh not all that cool by comparison. If you can believe it, they were asking $67.99 for a hobby box. I laughed and thought of how great the internet is, and how sad it is that companies like this are the reason for people shopping online and putting card shops out of business (not getting into this now). I also took a picture of how they sell hobby packs for the most part. 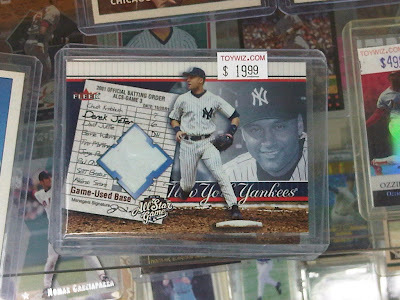 Base sets like Topps, UD, First Edition, and the like are on top of the case so that you can grab your own packs. Other hobby packs are displayed in a case so that you can't touch them, and there has never ever been a full open box in the case. Nice to know you are picking from pre-searched packs of air. They have a case of single cards which are ridiculously overpriced as well, but I took a picture of this one to show Sooz and I figured I'd share it with everyone. OK, I'm done with the tour of the store and onto what I got. I am too lazy to list the base cards so we won't be wasting time on those. I did end up with an error card which I only noticed because I scanned it and noticed there was no back. Blank back card of a guy I really find annoying for reasons that are pretty stupid. 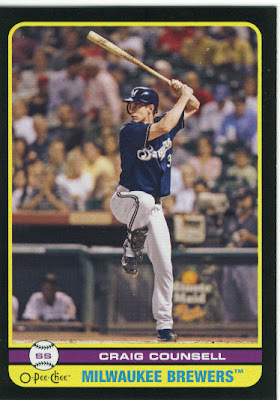 The card is a black bordered parallel of Craig Counsell. Here is a sample of what the base cards look like in case you haven't seen them yet. I ended up with 2 variations of this Jose Reyes card, and if there are any collectors of Reyes that have some Pujols from this set, come on down! 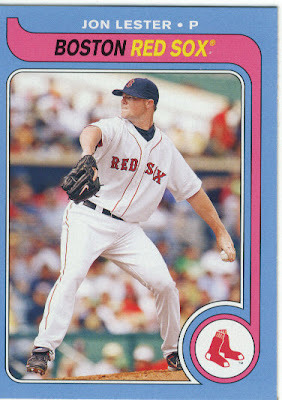 For some reason my scanner tends to crop off part of the right side of the cards. 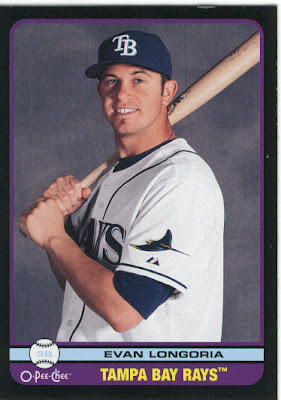 I got one mini black parallel of Khalil Greene, which looks the same as the big ones just smaller (duh). Here are the rest of the inserts, and the Longoria and Coke cards are not for trade. I scanned the checklist because I really like that they used a picture of the park for the card. Normally I don't like these kinds of things, but for some reason I just like this whole set. 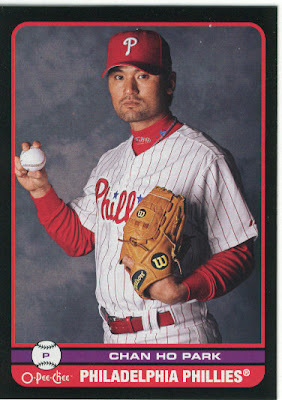 I ended up with one of these UD cards also which I will just forward to Voice of the Collector. I bought 5 packs total, which is unlike me since I never buy an odd number of anything. But since I am crazy and counted the packs in the box trying to see if any of the 36 were missing a.k.a. searched, I counted 37 packs. I know my math isn't great so I counted again, and again. Still 37, so I bought the extra pack as well. Makes me wonder if they combined a few boxes of packs after searching these as well. I would be lying if I said I wasn't thinking about shying away from blasters for a while to plunk down $44 on a hobby box. It's been way to long since I have opened one and I really think I would enjoy this one despite having no real need for more than 5 or 6 cards in the whole set. P.S. 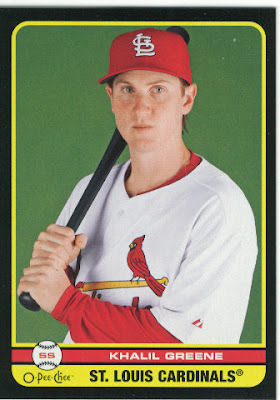 These would make awesome TTM cards to send out. These do look like nice cards for autographs. I may have to see about getting a box. I like the shops that have nothing but autos and jerseys in their cases and when it comes to getting cards for a set they are always fresh out. What could that mean? What kind of subset or insert is the Lester? 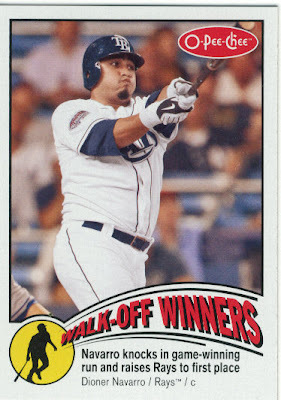 I guess Topps didn't have too much of a problem with Upper Deck doing baseball cards in vintage hockey card designs. It's card #RM-16, not too sure what subset this card belongs to but I am going to look around and see if I can find out. The Lester is from a 33-card insert set based on the 79-80 OPC Hockey set. 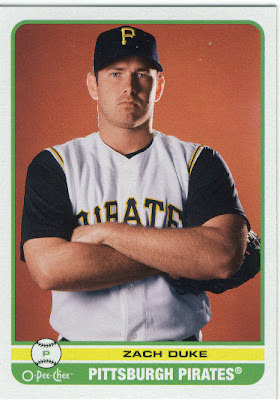 The first ten cards are of hockey players (I got one in my Hobby box); the last 23 of baseballists. They did the Hockey OPC inserts in the baseball set too? Dangit Upper Deck, quit making me like this set. 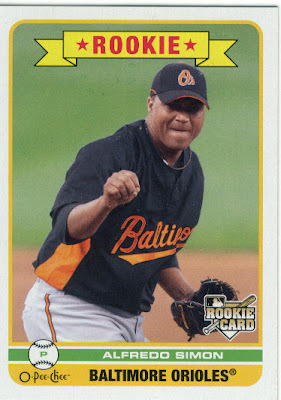 I just bought an OPC Walmart blaster on my way home tonight.It has two cut-out cards on the bottom of the box. Guess who one of the players is ? 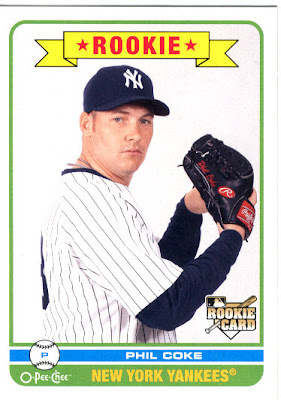 Hint: you didn't get one of this player in your pack and it's almost, already in an envelope addressed to N.Y.
Oh yeah, all I got is an Aaron Laffey, if you need or want it, it's all yours. Sure I'll take Laffey. Could I have one of the hobby wrappers too ? The retail wrapper is yellow.One of these days I'm going to write a post on my wrapper collection. Funny you should ask for the wrapper, I actually saved one and couldn't remember who collected them. But now I feel silly, lol. I will throw that in with Laffey. I think that Chan Ho Park needs to find a spot in my permanent bullpen. Perhaps we can discuss a trade. 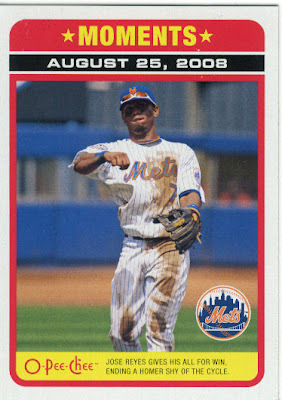 boo-hiss to UD for the 2009 OPC. 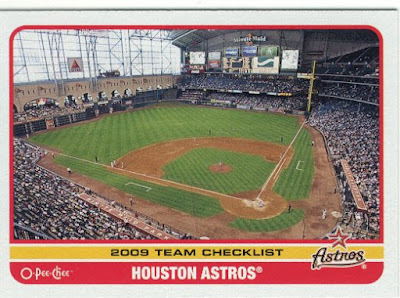 Your Astros team CL got me excited about collecting a CL set because I'm a sucker for ballpark cards. 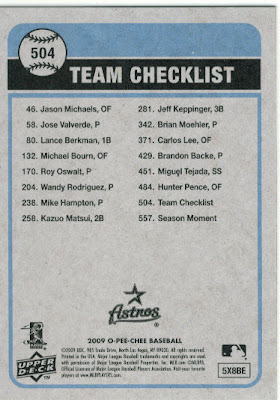 I found a Mets team checklist card on the bay that was not a pic of ****field, but rather a card that was of the design element I like to call decapitated heads (headshots only of depicted of various Mets). 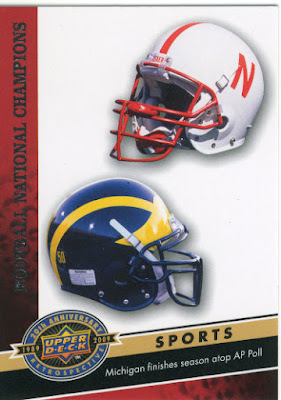 Either the CL has two variations (decap heads or ballpark views) or UD isn't consistant in checklist themes - i.e. all ballpark photos or all decap heads. I'll have to mosey on over to the UD site and look at the fronts of all the CL cards and maybe just pick up those that depict ballparks. i think you forget that toywiz has to stay in business and charge what they charge. to be honest, their prices arent that far off. they will definitely be off if youre comparing to internet pricing from sites like blowoutcards and dcssports. 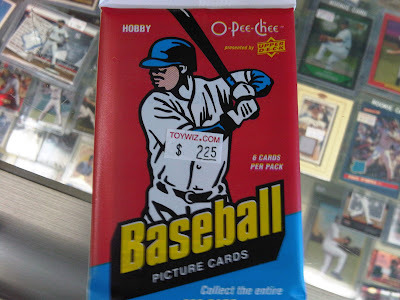 also, you posted about how awesome "the baseball card store" was in new jersey; their prices are almost the same as toywiz but their stock is not good at all. 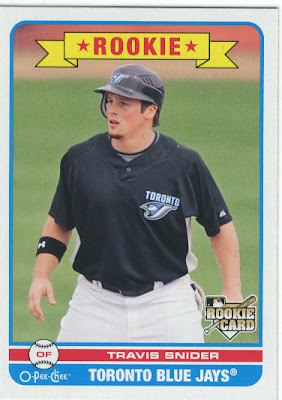 the baseball card store didnt have bowman sterling, topps finest, etc in stock where as toywiz had all of it. as far as the hobby packs being in the case. i hate pack searchers as much as the guys at toywiz probably do. 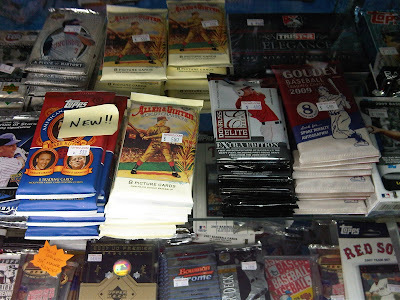 toywiz is the only store in rockland county that sells hobby packs, boxes and cases of baseball cards. i dont mind supporting the only store in the area in some-what of a recession. i could be buying everything on the internet at blowoutcards, but i also support local/small businesses that need to make money. - a satisfied toywiz customer. Anonymous, you are entitled to your opinion. If you feel the Toywiz is a hobby store, then you are mistaken. It is a toy and gaming store with a small selection of sports cards of which I was told are brought in from and outside person and not their company. Supporting a local hobby shop is one thing, but that is not what they are. A hobby store is a card shop that sells cards and related items, selling toys they buy at Target for double the price doesn't qualify them as a card shop. Hey there, just stumbled onto your blog here; good stuff! 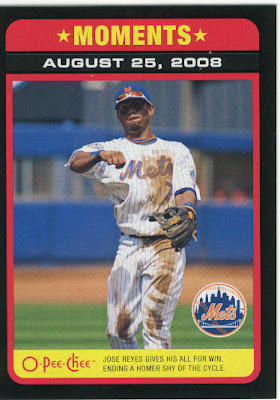 I haven't bought any of the 2009 O Pee Ches, but I'd love one of your Reyes cards (or Wright, or any Met really, that you end up getting that you don't need). Send me an email if you're interested in any of them!